Turkmen President Gurbanguly Berdymukhamedov and his Afghan counterpart, Ashraf Ghani, put on white work mittens at the Imamnazar station on the Turkmen side of the border on Monday to tighten the screw on a rail. 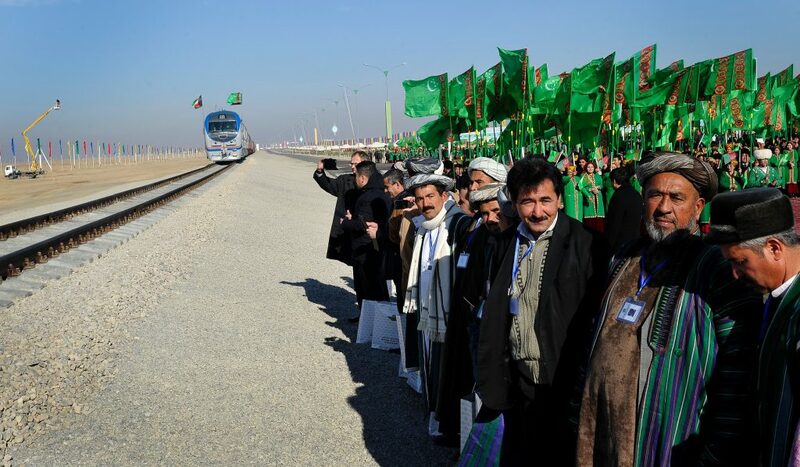 Turkmenistan: The presidents of Turkmenistan and Afghanistan have officially opened a new railroad that will link the oil-rich former Soviet republic with Afghanistan. Turkmen President Gurbanguly Berdymukhamedov and his Afghan counterpart, Ashraf Ghani, put on white work mittens at the Imamnazar station on the Turkmen side of the border on Monday to tighten the screw on a rail, The new railroad will bring Turkmen goods to Afghanistan, and the first freight train to depart carried grain, flour and some construction materials. Turkmenistan’s further ambition is to extend the 88-kilometer road further east to Tajikistan, Kyrgyzstan and onward to China. Two years earlier, Turkmenistan inaugurated a railroad that linked another former Soviet republic, the oil-rich Kazakhstan, with the Persian Gulf via Iran.